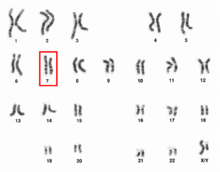 Human chromosome 7 pair after G-banding. Chromosome 7 pair in human male karyogram. Ideogram of human chromosome 7. Mbp means mega base pair. See locus for other notation. Chromosome 7 is one of the 23 pairs of chromosomes in humans. People normally have two copies of this chromosome. Chromosome 7 spans about 159 million base pairs (the building material of DNA) and represents between 5 and 5.5 percent of the total DNA in cells. Identifying genes on each chromosome is an active area of genetic research. Because researchers use different approaches to predict the number of genes on each chromosome, the estimated number of genes varies. Chromosome 7 is likely to contain between 1,000 and 1,400 genes. It also contains the Homeobox A gene cluster. Williams syndrome is caused by the deletion of genetic material from a portion of the long (q) arm of chromosome 7. The deleted region, which is located at position 11.23 (written as 7q11.23), is designated as the Williams syndrome critical region. This region includes more than 20 genes, and researchers believe that the characteristic features of Williams syndrome are probably related to the loss of multiple genes in this region. While a few of the specific genes related to Williams syndrome have been identified, the relationship between most of the genes in the deleted region and the signs and symptoms of Williams syndrome is unknown. Other changes in the number or structure of chromosome 7 can cause delayed growth and development, mental disorder, characteristic facial features, skeletal abnormalities, delayed speech, and other medical problems. These changes include an extra copy of part of chromosome 7 in each cell (partial trisomy 7) or a missing segment of the chromosome in each cell (partial monosomy 7). In some cases, several DNA building blocks (nucleotides) are deleted or duplicated in part of chromosome 7. A circular structure called ring chromosome 7 is also possible. A ring chromosome occurs when both ends of a broken chromosome are reunited. ↑ What is chromosome 7, "Genetics Home Reference" of U.S. National Library of Medicine. April 2008. [2014-05-14]. 1 2 3 Hillier LW, Fulton RS, Fulton LA, Graves TA, Pepin KH, Wagner-McPherson C, Layman D, Maas J, Jaeger S, Walker R, Wylie K, Sekhon M, Becker MC, O'Laughlin MD, Schaller ME, Fewell GA, Delehaunty KD, Miner TL, Nash WE, Cordes M, Du H, Sun H, Edwards J, Bradshaw-Cordum H, Ali J, Andrews S, Isak A, Vanbrunt A, Nguyen C, Du F, Lamar B, Courtney L, Kalicki J, Ozersky P, Bielicki L, Scott K, Holmes A, Harkins R, Harris A, Strong CM, Hou S, Tomlinson C, Dauphin-Kohlberg S, Kozlowicz-Reilly A, Leonard S, Rohlfing T, Rock SM, Tin-Wollam AM, Abbott A, Minx P, Maupin R, Strowmatt C, Latreille P, Miller N, Johnson D, Murray J, Woessner JP, Wendl MC, Yang SP, Schultz BR, Wallis JW, Spieth J, Bieri TA, Nelson JO, Berkowicz N, Wohldmann PE, Cook LL, Hickenbotham MT, Eldred J, Williams D, Bedell JA, Mardis ER, Clifton SW, Chissoe SL, Marra MA, Raymond C, Haugen E, Gillett W, Zhou Y, James R, Phelps K, Iadanoto S, Bubb K, Simms E, Levy R, Clendenning J, Kaul R, Kent WJ, Furey TS, Baertsch RA, Brent MR, Keibler E, Flicek P, Bork P, Suyama M, Bailey JA, Portnoy ME, Torrents D, Chinwalla AT, Gish WR, Eddy SR, McPherson JD, Olson MV, Eichler EE, Green ED, Waterston RH, Wilson RK (Jul 2003). "The DNA sequence of human chromosome 7". Nature. 424 (6945): 157–64. Bibcode:2003Natur.424..157H. doi:10.1038/nature01782. PMID 12853948. </bn> Lichtenbelt KD, Hochstenbach R, van Dam WM, Eleveld MJ, Poot M, Beemer FA (Jan 2005). "Supernumerary ring chromosome 7 mosaicism: case report, investigation of the gene content, and delineation of the phenotype" (PDF). American Journal of Medical Genetics Part A. 132A (1): 93–100. doi:10.1002/ajmg.a.30408. PMID 15580634. 1 2 3 4 5 6 7 8 9 10 11 12 13 14 15 16 17 18 19 20 21 22 23 24 25 Scherer SW, Cheung J, MacDonald JR, Osborne LR, Nakabayashi K, Herbrick JA, Carson AR, Parker-Katiraee L, Skaug J, Khaja R, Zhang J, Hudek AK, Li M, Haddad M, Duggan GE, Fernandez BA, Kanematsu E, Gentles S, Christopoulos CC, Choufani S, Kwasnicka D, Zheng XH, Lai Z, Nusskern D, Zhang Q, Gu Z, Lu F, Zeesman S, Nowaczyk MJ, Teshima I, Chitayat D, Shuman C, Weksberg R, Zackai EH, Grebe TA, Cox SR, Kirkpatrick SJ, Rahman N, Friedman JM, Heng HH, Pelicci PG, Lo-Coco F, Belloni E, Shaffer LG, Pober B, Morton CC, Gusella JF, Bruns GA, Korf BR, Quade BJ, Ligon AH, Ferguson H, Higgins AW, Leach NT, Herrick SR, Lemyre E, Farra CG, Kim HG, Summers AM, Gripp KW, Roberts W, Szatmari P, Winsor EJ, Grzeschik KH, Teebi A, Minassian BA, Kere J, Armengol L, Pujana MA, Estivill X, Wilson MD, Koop BF, Tosi S, Moore GE, Boright AP, Zlotorynski E, Kerem B, Kroisel PM, Petek E, Oscier DG, Mould SJ, Döhner H, Döhner K, Rommens JM, Vincent JB, Venter JC, Li PW, Mural RJ, Adams MD, Tsui LC (May 2003). "Human chromosome 7: DNA sequence and biology". Science. 300 (5620): 767–72. Bibcode:2003Sci...300..767S. doi:10.1126/science.1083423. PMC 2882961 . PMID 12690205. ↑ Nagamani SC, Erez A, Lee B (May 2012). "Argininosuccinate lyase deficiency". Genetics in Medicine. 14 (5): 501–7. doi:10.1038/gim.2011.1. PMC 3709024 . PMID 22241104. 1 2 3 4 5 Gilbert F (2002). "Chromosome 7". Genetic Testing. 6 (2): 141–61. doi:10.1089/10906570260199429. PMID 12215256. 1 2 Newbury DF, Monaco AP (Oct 2010). "Genetic advances in the study of speech and language disorders". Neuron. 68 (2): 309–20. doi:10.1016/j.neuron.2010.10.001. PMC 2977079 . PMID 20955937. ↑ Solé F, Espinet B, Sanz GF, Cervera J, Calasanz MJ, Luño E, Prieto F, Granada I, Hernández JM, Cigudosa JC, Diez JL, Bureo E, Marqués ML, Arranz E, Ríos R, Martínez Climent JA, Vallespí T, Florensa L, Woessner S (Feb 2000). "Incidence, characterization and prognostic significance of chromosomal abnormalities in 640 patients with primary myelodysplastic syndromes. Grupo Cooperativo Español de Citogenética Hematológica". British Journal of Haematology. 108 (2): 346–356. doi:10.1046/j.1365-2141.2000.01868.x. PMID 10691865. ↑ Lossin C, George AL (2008). "Myotonia congenita". Advances in Genetics. Advances in Genetics. 63: 25–55. doi:10.1016/S0065-2660(08)01002-X. ISBN 9780123745279. PMID 19185184. ↑ Grimaldi R, Capuano P, Miranda N, Wagner C, Capasso G (2007). "[Pendrin: physiology, molecular biology and clinical importance]". Giornale Italiano Di Nefrologia (in Italian). 24 (4): 288–94. PMID 17659500. ↑ Eggermann T, Begemann M, Binder G, Spengler S (2010). "Silver-Russell syndrome: genetic basis and molecular genetic testing". Orphanet Journal of Rare Diseases. 5: 19. doi:10.1186/1750-1172-5-19. PMC 2907323 . PMID 20573229. ↑ Zarchi O, Attias J, Gothelf D (2010). "Auditory and visual processing in Williams syndrome". The Israel Journal of Psychiatry and Related Sciences. 47 (2): 125–31. PMID 20733255. ↑ Velagaleti GV, Jalal SM, Kukolich MK, Lockhart LH, Tonk VS (Mar 2002). "De novo supernumerary ring chromosome 7: first report of a non-mosaic patient and review of the literature". Clinical Genetics. 61 (3): 202–6. doi:10.1034/j.1399-0004.2002.610306.x. PMID 12000362. Rodríguez L, López F, Paisán L, de la Red Mdel M, Ruiz AM, Blanco M, Antelo Cortizas J, Martínez-Frías ML (Nov 2002). "Pure partial trisomy 7q: two new patients and review". American Journal of Medical Genetics. 113 (2): 218–24. doi:10.1002/ajmg.10719. PMID 12407716. Wikimedia Commons has media related to Human chromosome 7.